Sergey Konstantinovich Gerasimenko was born on December 29, 1967 in the city of Tchaikovsky (Perm region, Russia). Childhood and adolescence of Herasymenko were exactly there. From his young age Sergey showed an active interest in fine art: he dug out of plasterboard, clay and painted a lot. At the age of 10 (1977), his family moved to Lutsk, Volyn region. Here begins his creative career as an artist: he studies at school, is actively involved in sports, but he regularly studies at a local art school. Where, under the guidance of teachers, he learns the basics of composition, painting and drawing. 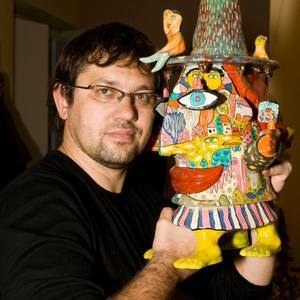 In 1983, Gerasimenko entered the Uzhgorod School of Decorative Arts in the department of artistic wood processing from where he was transferred to the Faculty of Ceramics, inspired by the works of ceramic artists of Transcarpathia. Where successfully he learns and masteres the ceramic handicraft. In 1990, after graduating from the college, Gerasimenko Sergey moved to Kiev and in 1993 entered the National Academy of Fine Arts and Architecture on the faculty of easel painting. During his studies at the academy, he is inspired by painting, drawing a lot, but is increasingly returning to ceramics with his thoughts. He likes to work with pleasing clay, feel the volume and shape, and he loves to draw. The love of painting and ceramics at the same time gave birth to a unique author's style «Happy Art». In 1999, Gerasimenko graduated from NAOMA and began her independent creative career. By that time, the basic idea of ​​his work was already formed: it was ceramics, of various shapes and sizes, painted with bright colored irrigation in the technique of majolica. In the process of becoming a ceramic artist Gerasimenko constantly experiments: looking for new color solutions and shapes. Serhii's early works are mostly painted abstractly, in pastel colors. Usually it was dishes: teapots, tea makers for coffee, dishes, turks, vases, pyals, etc. In a later period the painting received clear plot images and resembled a kind of collage. In addition to the dishes, the author began to make a large number of statues of animals, people, mythical characters. Also, among his works, there are interior and décor items: original wall panels, lamps, caskets, watches, candlesticks, etc. The color palette of works has become bright and colorful - all these creative changes have determined the unique and unique author style «Happy Art». Majolica Gerasimenko differs dramatically from all works performed in this technique. First of all, it is a riot of bright colors, an endless flow of plot images, which the author can very harmoniously group into a fantastic collage. All the plot pictures of the author are bright and positive, written in the style of naive art, cause a smile and warm feelings. In the diversity of plots there are people, all kinds of animals, mountains and the sea, clouds and planes, houses and trees, etc. This author's technique of painting is unique in its kind, which has no analogues in the world, was called the artist "Art of Happiness" or Happy Art. Since 2018, Sergei Gerasimenko has been using the creative pseudonym Ser Gera, which has signed some of his latest works. Previously, the Author signed his works with the full name Sergey Gerasimenko or abbreviated S.Gera. 2017 (June - September) - International Biennale of Artistic Ceramics (Museum - Reserve of Ukrainian Pottery in Opishne).